You know if you have an eye for it, you can spot effective self-organization in companies all over the world. Actually, you can see it at work in the world period. It isn't just found within digital agency teams. Self-organization may seem like a lofty, complicated concept; it feels complex. That's probably because it spells out some of the underlying dynamics found in atomic structures, laser plasma systems, robotics, biological systems... you know, the simple stuff. But let's focus on the things we all know. The obvious stuff. What’s obvious is that within some of these most intricate systems, the processes seem to run themselves. Things appear to just happen and they seem to happen with such ease. Their dynamic parts and pieces falling into a proper place and just working together. There’s a lesson here and a payoff for all of us. These principles can be applied to your organization and its systems. By definition, a system is a collection of entities, parts, and pieces inclined to a common end—like a goal. A purposeful existence can self-adapt in meaningful ways to its ever-changing environment. These objects need to self-tweak and self-organize to meet defined objectives. When purposeful existence is adapted to our psychology, then by extension complex social structures, and finally to any system with which we’re actively or passively involved in, they become a productive work system. Here are some details to encourage productivity, foster cultural agility, and review dynamics of agile digital agency teams. Each system is impacted by its environment continuously; change is constant. For an environment to be productive, it must support production. The essential purpose of any designed environment—in which a productive system operates—is to facilitate production regardless of change. By nurturing self-organization, this becomes possible. Only through self-organization can the means of productivity quickly react and adapt to change. Empower digital agency teams to readily adapt to priority changes. Fostering organizational agility is a journey. There’s a road to agile, and it’s a transformation. While project teams are supported by scrum masters, products owners, and agile ceremonies; success though lies in fundamentally changing how people do their daily work. Here culture plays a vital role. When applied to agile project teams or agile pods, systemic theory dictates that every system needs a set of guiding rules. Scrum, which is one of the agile frameworks, is nothing but a set of rules that are agreed upon to achieve goals. Transparency, inspection, and adaptation allow the pods that form a system to work effectively toward a goal—this is what makes a high performing teams. These simple views explain why the client must be an active participant in the project dynamics since they're an active component of the whole. Clients impact not just the input flux like project requirements and priorities, but also output flux as in acceptance to project releases via user acceptance tests (UAT). The objective of any system is to improve continuously and emerge. Emergence means achieving something with the power of togetherness. Something that’s impossible independently. Emergence in "pods" is best understood as empowered individuals form high-performing digital agency teams. Any well-oiled system needs to have meaning and purpose defined; this creates its mission statement. It’s fairly easy to relate this scientific need for a fixed point, attractor, or even vision. Most high performing teams know the values they are delivering in a sprint or a release. If the team deviates from their goals, they are expected to self-reflect, adapt and come back to the fixed point again. "Some of the best leadership comes from everyday acts from people"
When self-organised and empowering principles are blended with the right process, as a catalyst, allow acts of leadership. The process (and its related operational support) becomes a way to enable people and empower them. It enables leadership and effective decision-making. And ultimately this minimizes management overheads. We have been practicing Kanban at Axelerant. It blankets our current delivery execution frameworks for more efficiency. And in turn manifests empowerment as emergence. The process by itself allows for the team autonomy to make decisions and remove bottlenecks. In a project context allowing opportunities for acts of leadership from team members makes it less transactional and more transformational. "Leaders as enablers to future leaders" perhaps this would be the best way to think about transforming the definition of project management. At Axelerant, we witness acts of leadership from our team members—particularly with Kanban as a process. 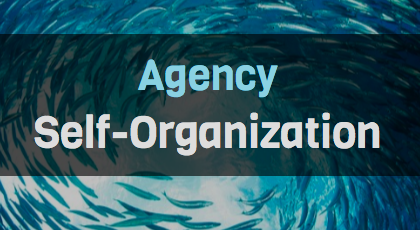 Through productive environments, cultural agility, and agile teams; self-organizing digital agency teams rapidly take shape. There's no better way. This article was originally published on October 2015. It has since been updated. 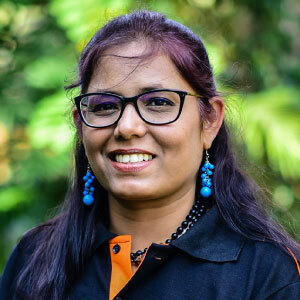 She is the lead operations architect and driver of everything we do here and she's our resident Ph.D. (in physics, actually).